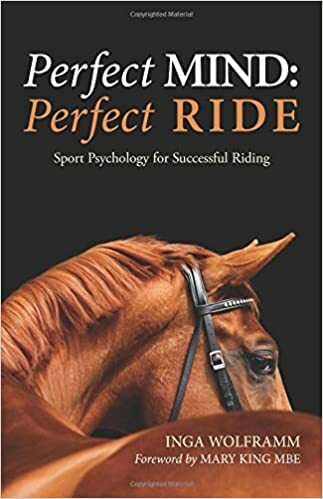 Perfect mind: perfect ride by Inga Wolframm. Wiola had a give away on her blog and I was the lucky winner - lucky because I won something (that is yay itself already) and even more lucky that it was such a valuable prize. The book is - as you could guess by the title - on mental training - you know how difficult the right mental attitude for me is, how hard I struggle against inner demons, how often I already wrote about it, how often I tried to come up with new ideas, new approaches. I even had great guest blogs and all brought some light in the dark, all brought me a tiny little step further. This book though, really let's me think twice. About my habits, about my weaknesses and about my strengths. About goals, about competition, about ME. In the first part of the book, Inga talks about one of the biggest threats to a perfect mind: comparing yourself to others. Trying to win JUST to beat others. Being better than OTHERS. I have talked about being better than yourself before (here) and I am well aware that the only person you can really compare to is yourself. But: who are you? Who do you think you are? How do you see yourself? And: how do others see you? Why to think about this? To me, it was an enlightening moment to realize just a few weeks ago that the image that I have of myself is obviously not the same as others have, which is of course very likely: you either have a higher opinion of yourself (oh my, there is tons of people who have that when you ask me) or you have a lower one. The concept of how you see yourself is called self-image. Your self-image is built from impressions you gathered over time and they define how confident you are. Imagine the always being last in class: of course, his or her self confident must be low even though he or she might be a good rider. Too many negative impressions make up for a low confident rider, having a negative image of himself and struggling to get out of this rat hole and overcome all the negative thoughts in his or her head. We humans tend to memorize bad things that happen to us more than the good ones (take for example the queue at the cash desk - you will always perceive that you are in the wrong lane - even though that is not true - that is even mathematically proven!). Changing your self-image into a positive one is a pretty difficult thing because who is going to stop you from being unrealistic? Judging yourself is good and a negative thought here and there can foster progress in what you are doing. I have realized that in theory that all looks good. And still, I have that negative image about myself and my riding. 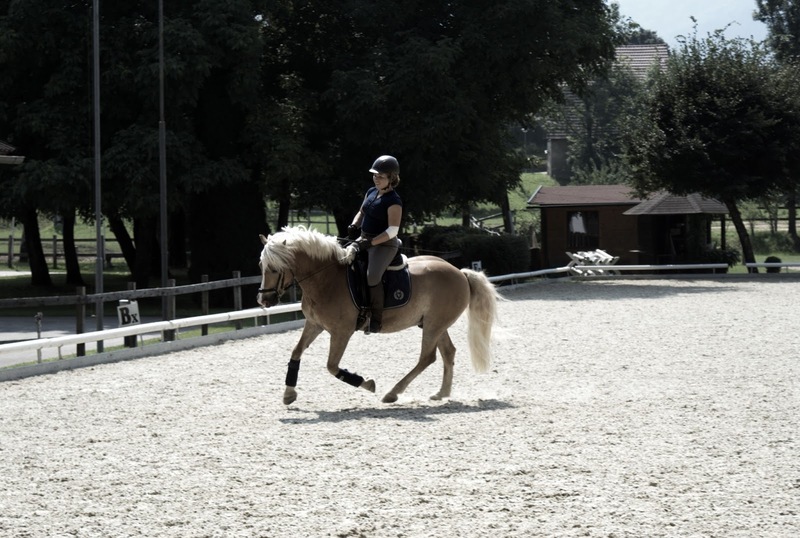 But here is the positive thing: I am a DRESSAGE RIDER! I get judged EVERY single ride at a show - so why not using this OUTSIDE image to CHANGE my inside image of myself?! It should be somewhat realistic, right? Judges are not there to do me a favour - they literally judge what they see. That brought me to the idea of looking at my results over the current season. You know that I rode in March for the Alpe Adria Dressage Trophy qualfier. On Saturday, we got a 61,532% for the FEI World Dressage Challenge Elementary test. On Sunday, we got a 58,500% for the World Dressage Challenge Medium Test. People can very quickly have a very poor self-image. It doesn't take much. We were not bad, of course, at the end of the ranking but still, last year we would not have been capable of riding such a test at all. That alone would not allow any positive impact to my self-image. I would rather ask myself WHY I did not even perform better. So I rode the same tests two weeks ago. I got a 62.613% for the WDC Elementary and a 63.000% for the WDC Medium test. Same judges, almost same competitors as this was again an Alpe Adria Dressage Trophy qualifier. And here we have it black on white: Within a rough three months time frame I improved, from 58.500% to 63.000%. That is a 4.5% difference! In dressage world, that is a huge step! And no, it is not that in March I had a bad day and a very good one on the second try. NO! It was really an improvement - it is even difficult to accept that fact. When I started to ride shows in May, we lacked so many movements for this level still and I had just changed trainer. Now, after also changing barn, the hard work pays off. You can see the results, I can see the results, the judges see the results. Here again it shows that comparing to others would not foster my positive self-image. Sure, we were among the last ones in the ranking (ok, the second one almost gave me a ribbon) but we improved, there is the evidence. And when you define success as being better as before, we were successful. Measurable a 4.5% more successful than only a few months ago. It is still hard for me to see that and it is even harder for me to believe it. That is why I need to write it down. Or as one of my co-workers says when going down to the canteen for lunch and I ask him what he is going to choose: SEEING IS BELIEVING! So do not close your eyes from reality. And still, there is this inner voice saying that this might be a coincidence. So let's dig for some more proof and check only the results from the season so far: test LM5 in May: 58.952%, in June: 62,333%, in July: 63.922%. As you can see, there is more than one test where we improved (tremendously) over time. Of course, there is no guarantee that things will go on like this. There will be days when tests we rode pretty good already will go worse. But that should not change my self-image built up with all the positive experience over the season. Remember, a negative thought here and then just encourages "change, hard work, growth and success" (http://www.mtstcil.org/skills/image-1.html). There are many ways a person can change negative thoughts and self-criticism to more realistic and positive thoughts. Focusing on all of them at once may be overwhelming, but focusing on a few at a time and reminding yourself of these positive approaches regularly can change your self-esteem. Read the positive thought strategies below and choose several that would help you most. Write them down and remind yourself to pause and change your way of thinking each time you are being critical of yourself. As you become more comfortable with each new way of thinking (for example, learning not to apologize or accept blame for other's anger) try adding a new positive thought strategy to your list. Nip negative thoughts in the bud. Sometimes putting a stop on negative thinking is as easy as that. The next time you start giving yourself an internal browbeating, tell yourself to "stop it!" If you saw a person yelling insults at another person, you would probably tell them to stop. Why do you accept that behavior from yourself? Instead of focusing on what you think are your negative qualities, accentuate your strengths and assets. Maybe you didn't ace the test you were studying for, but maybe your hard work and perseverance led to a better grade than you would have had. Maybe you felt nervous and self-conscious when giving a presentation at work, but maybe your boss and coworkers respected you for getting up and trying. Maybe you did get nervous and blow that presentation at work - so what? Talk to your boss about what went wrong, try to address the error in the future, and move on. All people have flaws and make mistakes. Your boss, coworkers, friends, family, postman, congressman, and favorite movie star have all made mistakes. They've forgiven themselves; so can you. Perfection is a high goal to aim for -- you don't need to start there or even end there. Make doing your best your ideal -- what more can you realistically do? Focus on what you've gained from the process and how you can use it in the future. Avoid focusing on what wasn't done or 'should have' been done differently. Allow yourself to make mistakes and then forgive yourself. Try laughing instead of criticizing. "Should have, could have, would have ... " Try not to constantly second guess yourself, criticize yourself for what you "should" have done better, or expect too much from yourself. Don't put standards on yourself that you wouldn't expect from others. It's great to want to do well, but expecting yourself to be perfect (which is impossible) and then punishing yourself when you fail is a vicious cycle. Using expressions like "I should have" is just a way of punishing yourself after the fact. Don't feel guilty about things beyond your control. You are not to blame every time something goes wrong or someone has a problem. Apologizing for things and accepting blame can be a positive quality, if you are in the wrong and if you learn and move on. But you shouldn't feel responsible for all problems or assume you are to blame whenever someone is upset. Don't feel responsible for everything. Just as everything is not your fault, not everything is your responsibility. It's okay to be helpful, but don't feel the need to be all things (and do all things) for all people. This is taking too much of a burden on yourself AND limiting those around you. Let others be responsible for themselves and their actions -- you shouldn't feel responsible for their happiness. Just as you can't "make" other people happy, don't expect others to "make" you feel happy or good about yourself. In the same way, they shouldn't make you feel guilty or bad about yourself. You create your own feelings and make your own decisions. People and events may have an affect on your emotions, but they can't dictate them. You don't need to be all things to all people or please everyone. Give yourself permission to decide you're doing the best you can. Remind yourself when you're doing things well -- don't wait to hear it from someone else. You can choose how to interpret comments and events, so try for the more positive interpretations. If someone says, "You look good today," don't ask yourself "What was wrong with the way I looked yesterday?" Accept compliments graciously (don't ask yourself why you haven't been complemented on something else or why you haven't complemented you before.) Look at temporary setbacks as opportunities for growth. Try not to hang on to painful memories and bad feelings - this is a surefire way to encourage negative thoughts and bad moods. Your past can control you if you don't control it. If you can, forgive past wrongs and move on. (Don't forget that forgiving yourself is an important part of this process, too!) If you have a hard time forgiving or forgetting, consider talking through your emotions with a good friend or counselor, but try not to dwell. It's important to work through things, but you can't let the past determine your future. Avoid "can't" thinking or other negative language. If you say something often enough, you may start to believe it, so keep your statements positive, not negative. Don't be afraid to seek help in accomplishing things, but remind yourself that you don't need approval from others to recognize your accomplishments. Focus on what you're able to do. Remind yourself of all your capabilities and positive qualities. Taking the first step and asking yourself who you are is a difficult one. But it is a necessary one in order rephrase the negative thoughts in your head into positive thinking. Positive thinking that will foster your performance. Do not forget that the only person whom you are competing against is yourself and the more you know about yourself the better. Your self-image should be checked against reality, or, like in my case, use reality as a proof for what you should know already. I am still in doubt about our progress, it is not that I already FEEL it. But I can see it, on the marks sheets, pictures, videos. And what did we learn too today? Seeing is believing.